Passive House is a building standard that is truly energy efficient, comfortable, affordable and ecological at the same time, without using the normal high levels of conventional heating associated with a normal house. 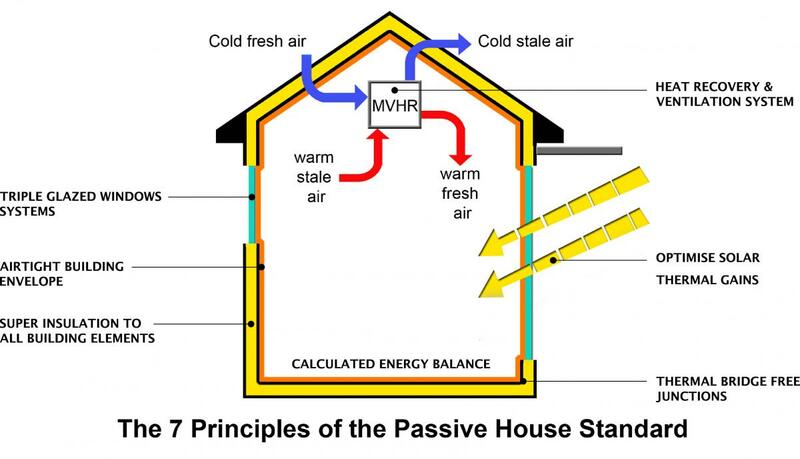 Passive Houses allow for heating and cooling related energy savings of up to 90% compared with typical building stock. In terms of heating oil, Passive Houses use less than 1.5 litres per square meter of living space per year – far less than typical buildings. Passive Houses have high levels of comfort, using energy sources inside the building such as the body heat from the residents or solar heat entering the building – making heating a lot easier. The main focus of the Passive House is the ‘fabric first’ approach. The vast energy savings in Passive Houses are achieved by using especially energy efficient building components and a quality ventilation system: but not cutting back on comfort. The house itself needs minimal energy to begin with! As with our Low Energy ECOHomes, we believe that Passive Homes can be delivered in a affordable way at the time of the build but with the cost savings over a short period of years, the Passive House pays for itself in no time. Passive housing is effective for any building that uses energy - residential housing, offices, schools, supermarkets and factories.